Vans Chukka Low Cardiel Spitfire is a new summer color way. A collaboration with Vans and John Cardiel’s DLX sponsor Spitfire Wheels. 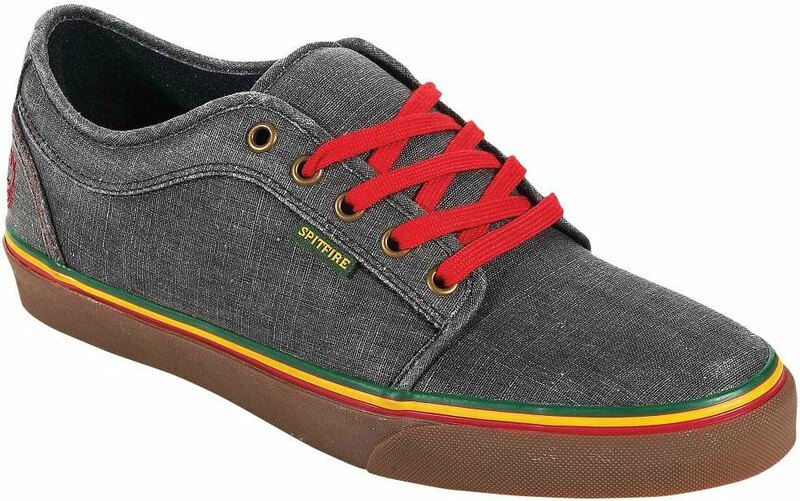 This all vegan skate shoe has a hemp canvas upper with some true burner’ flare! The classic style of the Chukka Low is emblazoned with rasta stripes above the gum outsole. The heal cap and tag feature the Spitfire flame guy on the heal cap and a Spitfire tag along the lace cage. In true Cardiel fashion these shoes are full on, no short cuts. They are rastafied down to the vulcanized waffle soul. If you haven’t heard (or seen last months Thrasher) Cardiel is back on the board and ripping harder then ever. All Hail Cardiel! After a storm of traffic to this today page, here is an update. Zumiez has 1 pair of size 8s. Good luck. Finally a vegan chukka! And by the legendary cardiel! How can you go wrong with that? Interesting, is Cardiel much of a rastafari? Cardiel is a HUGE reggae fan. I don’t know if he’s technically a rastafarian.